Earlier this year, we asked readers on our Maine Homes website if they had a room whose design they were particularly proud of, a house with head-turning curb appeal, or an impressively landscaped yard. The kicker: Did they think Martha Stewart would agree? 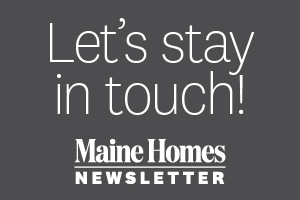 Dozens of confident souls came forth, submitting 161 entries across five professional and five amateur categories in our inaugural Maine Homes Design Awards contest: curb appeal (house exterior), living and/or dining room, kitchen, bath, and landscaping. More than 4,000 visitors also viewed our online gallery, casting votes to pick a Reader’s Choice winner in each category. And it was all for a good cause: Fifteen percent of the net proceeds we collected from entry fees went to the Maine chapters of Habitat for Humanity. “I was so impressed by the number, quality, and variety of entries and how entrants attempted to integrate functionality and local materials into their designs,” says Stewart, who blindly judged the competition along with four other industry heavyweights: designer Angela Adams, architectural photographer Trent Bell, interior designer Loi Thai, and architect Carter Williams. Congratulations to the winners who submitted the 10 standout projects shown on the following pages. And to all the entrants, thank you for sharing your hard work with us. Matthew Elliott says: Located at the edge of a harsh sea environment, this collection of buildings marries the familiar with the unexpected. 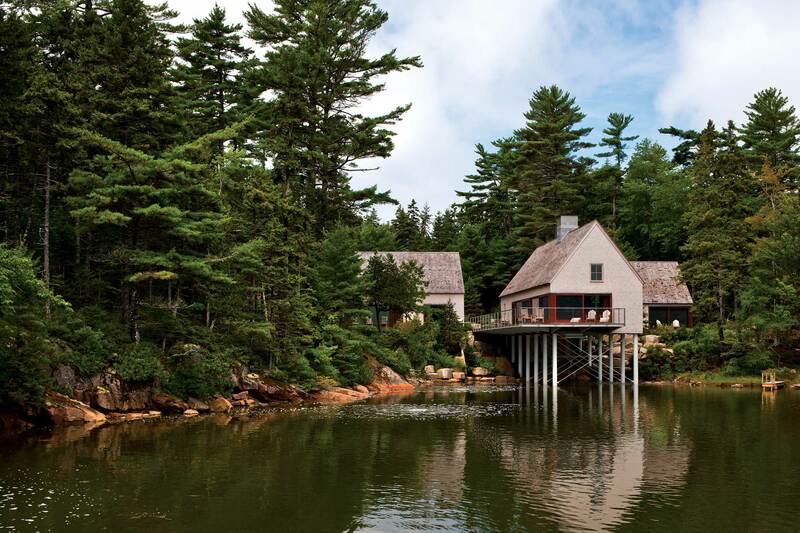 Three simple cottages linked by a series of decks make up the summer compound, which extends over a tidal salt pond. 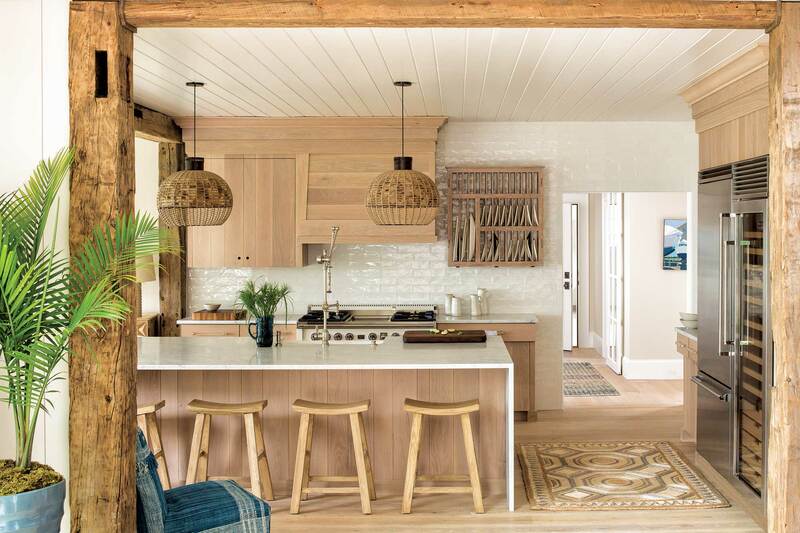 Inspired by local fishing shacks and wharf buildings that dot the coast of Maine, this retreat weaves large glazed openings into the modest, shingled New England cottage forms. 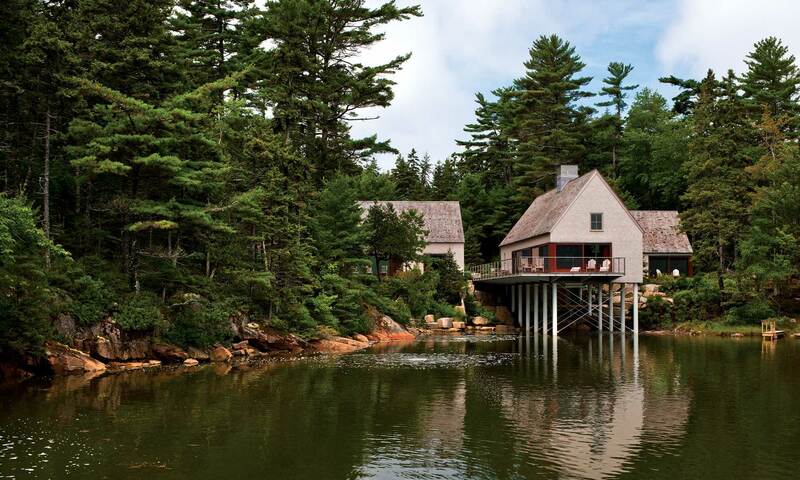 Carter Williams says: This home immediately calls to mind the classic fishing-shack-on-stilts typology so familiar along rocky New England shorelines. However, this modern incarnation has a strength and permanence that will allow it to withstand any storm that blows its way — with no compromise to the visual delicateness of the structure or its gentle, practically levitating, connection to the site. Vernacular massing and materials and spare, quiet detailing keep the focus firmly on the home’s unique perch between forest and sea. Russ Tyson says: This home’s main living space is elongated north to south and includes oversized doors on opposing sides. To the east, the preferred view — with its stretch of field and cherished pitch pine in the foreground — takes center stage. This expansive panorama is made more spectacular with the inclusion of its western-oriented counterpart. Here, an intimate courtyard, with a native pitch pine backdrop, offers shelter from aggressive afternoon winds. The progression from the east-facing field, to the living space, to the west-facing courtyard allows the family to follow the path of the sun throughout the day. At the southern end of the living space, a screened porch offers shelter on buggy days. Outside, an oceanfront patio with a fire pit affords marshmallow toasts and stargazing. Loi Thai says: This project has such perfect harmony. There is a wonderful relationship between inside and out, as all the windows and doors bring the natural beauty of Maine indoors. The décor and architecture also complement each other beautifully without one overpowering the other. 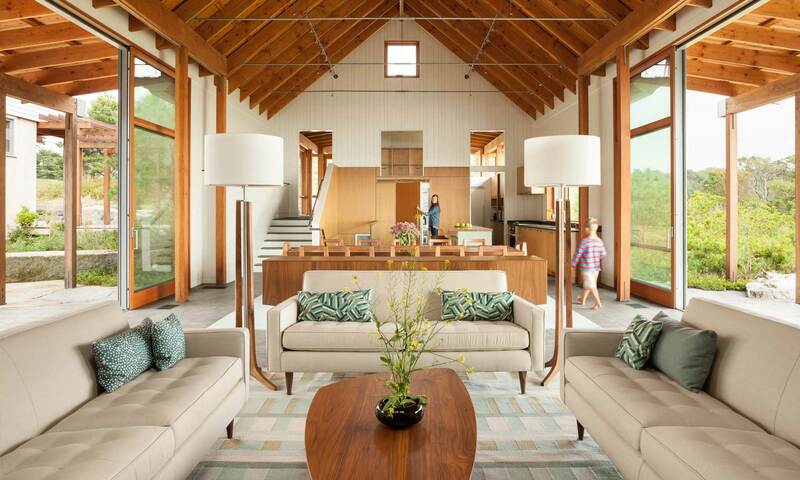 The living and dining spaces are layered and inviting. 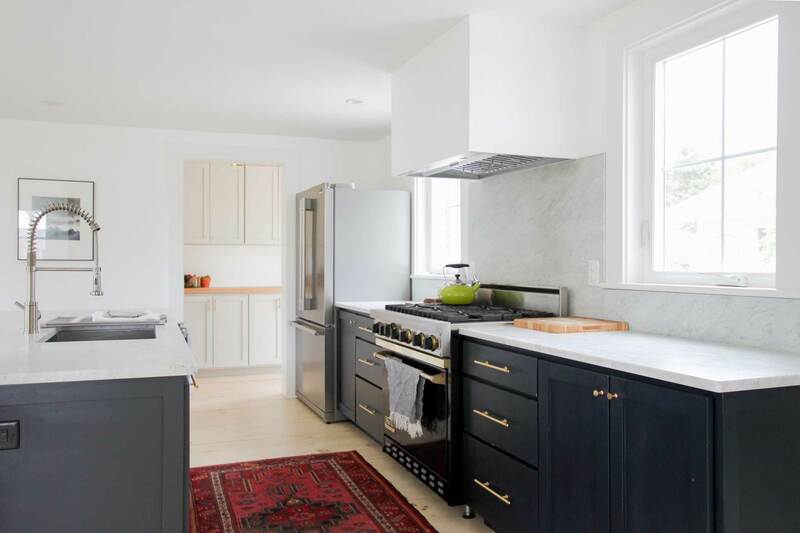 Nicola Manganello says: To me, this kitchen in a new Shingle-style home overlooking Broad Cove is about texture and subtly contrasting tones. Simple white ceramic tile on the walls highlights the whitewashed quarter-sawn oak cabinetry, while a waterfall marble countertop adds a contemporary element. The abaca rug in the foreground was hand-woven in Indonesia; we customized the colors and pattern to complement the space. Simple saddle stools underscore the kitchen’s clean lines and are easily tucked away. Angela Adams says: This is one of my favorite entries. The neutral palette creates a calm, comforting environment. I love to see natural wood in kitchens, as it’s a perfect grounding material for busy areas. When all of the elements in a room live in harmony, the space softly hums and enables us to feel peaceful and restored. This room has great energy. Nicola Manganello says: Discovering a pair of curvaceous mid-century nightstands presented an opportunity to create something unique. They are suspended on the wall and topped with Carrera marble. I kept the rest of the room simple and neutral to highlight the wood grain and allow the vanity to be the focus. In the negative space between the two pieces, there’s another geometric point of interest. Overall, this bath is clean and streamlined, while combining traditional and contemporary elements. Trent Bell says: Several things caught my attention here — the warm and calming palette and the tasteful restraint employed in the selection of “back-up singer” pieces to accompany the star of the show: the vanity. This vanity is a wonderful surprise and a clever reuse of materials. Anytime something makes you stop and take notice due to its creativity and beauty, well, that’s a good moment in your day. 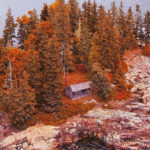 Matthew Elliott says: The existing garden included native plantings, such as blueberries and sweet fern, set among lichen- and moss-covered granite tailings from prior industrial activity. The main goal was to create a spa and seating area that felt at home in this beautiful, rustic, yet meticulously maintained environment and to do so in a way that caused minimal site impact. Cut-granite pavers form an organic pattern that nests with the surrounding quarry walls and the spa appears as a seamless void in the hardscape. Supplemented with more native plantings, the garden has an air of timelessness. Instead of stylistic overtures, there’s a strong sense of materiality that imbues the space with a feeling of solitude. 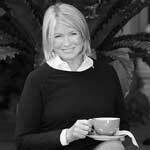 Martha Stewart says: Landscaping, as many are aware, is one of my passions. Asticou Azalea Garden in Northeast Harbor is one of my favorite local gardens because of the way it has been meticulously adapted for coastal Maine’s demanding conditions. And landscape architect Jens Jensen, known for his naturalistic approach, designed much of the grounds at my home in Seal Harbor, Skylands. This project, with its native plants and stonework, also feels organically landscaped, allowing Maine’s natural treasures to have pride of place. I appreciate the modern approach to entertaining (and relaxing), with judiciously designed areas of sun and shade. Nancy Lighter says: The idea for this barn began one winter when our entire family came to Maine for Christmas. 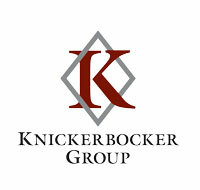 We live in South Florida and maintain our property on Casco Bay as a second home. Feeling a bit overcrowded, we decided we needed more space to enable us to spread out and better enjoy our time together. We began discussing the idea of a rec barn, nestled among our 100-year-old apple trees, with our builder, Matt Wogan. 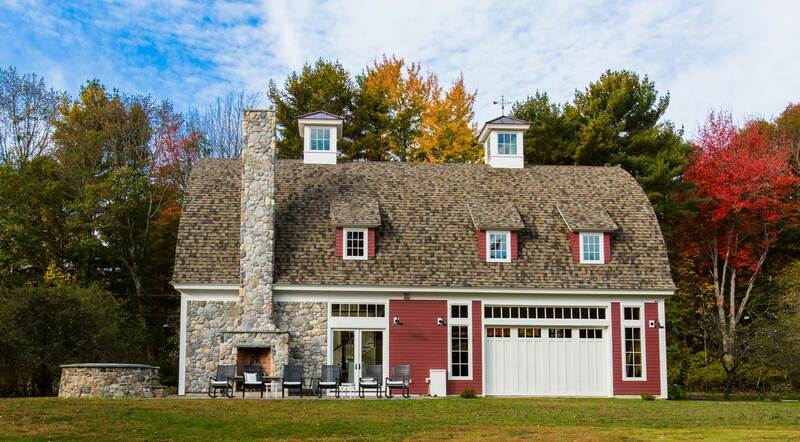 I wanted a classic, New England–style red barn with a large living room where my family can watch the deer that come to eat apples every evening at dusk, a substantial kitchen, open to the living room, so we can all be together when preparing meals, and a game room upstairs. We recently had my daughter’s wedding on the property and the barn was filled with family and friends, whom I visited with while sitting on the couch in front of the fireplace, holding my newest granddaughter. Loi Thai says: From the barn form to the stonework commonly found in Maine, this project is a poetic gesture to the local landscape. Details such as the expansive wall of windows on the ocean-facing gable end and twin cupolas give the building character, curb appeal, and drama. It’s a beautiful design from every perspective. Sarah Madeira Day says: This area of our 1729 home was a series of small rooms before we opened it up into one L-shaped space encompassing a living room, sitting room, and dining room. We did all the work ourselves, which involved taking down walls and the ceiling — uncovering beautiful old beams — painting the walls and floor, putting in new lighting, building in customized Ikea storage, and more. We have worked to keep the original home as original as possible while incorporating a bit of modern flair. Trent Bell says: When I take in the design/renovation of this house, I’m most impressed by the respect for the original vernacular architecture. Exposing the ceiling members created airiness in the small space while accentuating the antique construction of the home. The compact feeling is further mitigated by the generous use of white on the walls, trim, and floor. This clean backdrop serves as a luminous canvas for the interesting and minimal interior pieces that have been chosen. Sarah Madeira Day says: This was a dark, segmented space with appliances scattered throughout different rooms and narrow walkways. Cooking in the cramped rooms was like playing Tetris. We wanted a kitchen that was traditional in structure yet modern in detail. The cabinets are classic Shaker style with contemporary brass hardware. The floors are conventional wide pine with a fresh white pickle stain. Our designs are a mix of our styles, with Wes incorporating wood and stone and me adding white and trendy touches. You can’t have one without a bit of the other — it’s what keeps us, and our home, balanced. 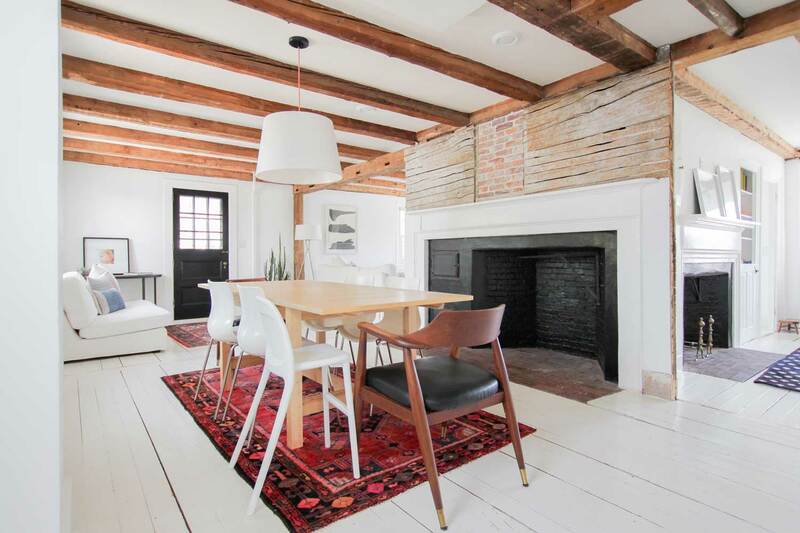 Carter Williams says: This renovation is chic and well edited. Painting the walls, doors, and trim a crisp white and whitewashing the wide-plank floors gives the space a serene, airy feeling. Meanwhile, black cabinetry provides a punch of contrast and balances a beautifully minimalist materials palette. The project team’s use of historically inflected materials — double-hung, divided-lite windows, simple Shaker-style cabinets, pine flooring — treated in a restrained, modern way, gives a nod to the home’s long lifetime while celebrating contemporary family living. Sarah Fischer says: From the moment we first toured our 1844 farmhouse, we knew the primary family bathroom would need our attention as soon as possible. There were three entrances in the 7-by-9-foot floor plan and a tiny water closet with zero privacy. 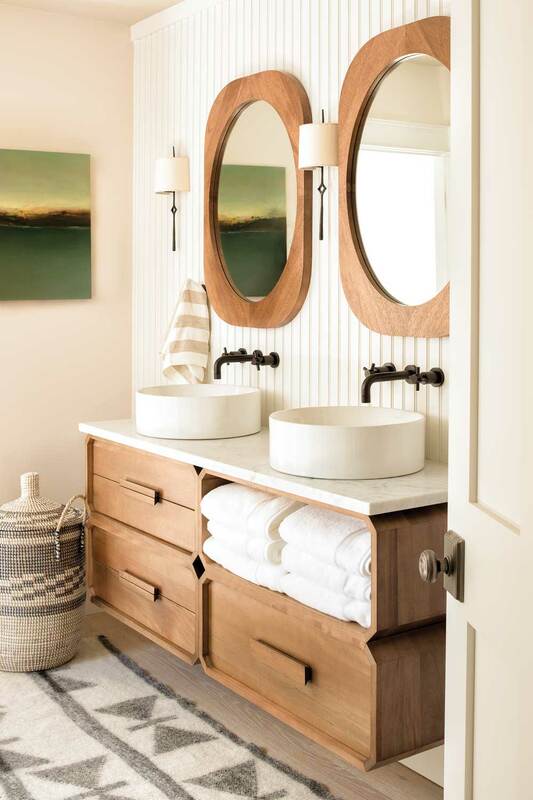 We eliminated a doorway, relocated the toilet, and furnished the former water closet with a vanity, custom welded by our talented builder, Russ Pearce, and topped with a piece of marble found in our barn. For us, the finished bathroom is a lovely mix of period elements — an antique pine dresser turned vanity, a bench topped with one of the room’s original pine floorboards — and new ones — a glass shower surround, marble-tile floor with radiant heat — and is just what our dear old home deserves. Martha Stewart says: I love the step-in shower with the built-in shelf for toiletries and subway tile, which has the benefit of being relatively inexpensive, fresh looking, and easy to maintain. If one has space in the floor plan, as was the case here, it’s ideal to have separate shower and dressing areas and separate sink and toilet areas. Coming from a family of eight who shared one bathroom, I know that a busy family would value this design! 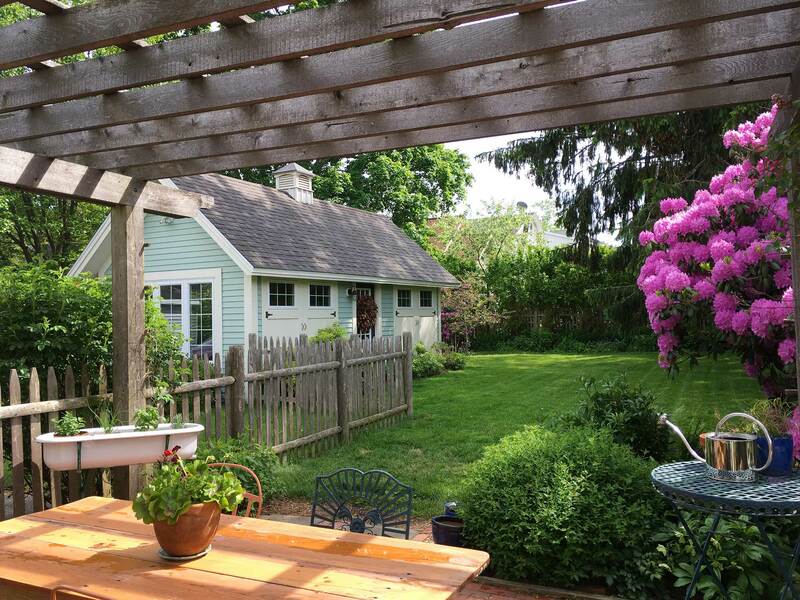 Meredith Perdue says: For us, living in a small, 1750s Cape with a larger yard, one of the best parts of summer in Maine is that our livable square footage seems to double. When we moved into our home eight years ago, a fenced-in backyard was a must for our dog. To soften the fence and provide a lattice for eventual shade vines, my husband and father built a hemlock pergola and laid a brick patio for meals and entertaining. As time went by and we learned how we liked to use the yard, we added a studio, peastone fire pit area, and stone-edged perennial garden, which provides color (and gardening lessons) throughout the summer. Angela Adams says: I love how this space is a sanctuary for the couple — a luxurious private retreat in the backyard. 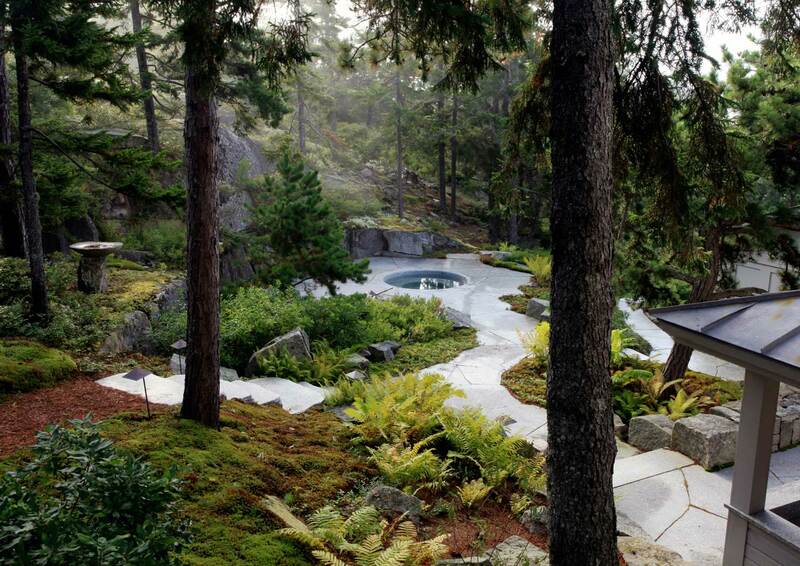 The lush landscaping creates privacy, texture, and a rich natural palette. The pergola provides sun-speckled shade over the dining area. This is a perfect space to socialize or just be alone surrounded by the beauty of nature.